Representatives from the Thomas Dale High School Class of 1967 presented a $1,000 check to Hugh Cline, chairman of the Chesterfield Cultural Arts Foundation for the purchase of a theater seat plaque. 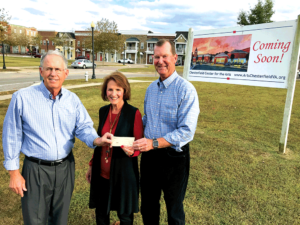 Funds were raised during their recent 50th class reunion. Do you have your seat yet? With a $1,000 contribution to the Chesterfield Cultural Arts Capital Campaign, you can permanently commemorate your support for the arts in Chesterfield County with an engraved plaque on one of the seats In the state-of-the art theater. Visit www.artschesterfieldva.org to donate.